Youtube has made a major change that has many content creators up in arms. Yet they may have been working on flawed business models to begin with. We’ll look at this more in-depth on this 5 minute Smack! You may include paid product placements in your video content. All product placements will need to conform to our ad policies. Within those ad policies it states if you get paid to do a product placement – like an ad within a video or a whole video featuring a product – you must mark it as a “Paid placement” when uploading said video. YouTube may then require up to a 45% cut of the revenues you made from that sponsorship. So if you have a $10,000 sponsorship for Acme cola, YouTube may ask for up to $4,500 of this. Why is YouTube Asking for a Cut? Are they Greedy? Well, lets look at it from the opposite end – If I am Acme cola and want to advertise, would I back my ad dollars on YouTube or would I circumvent the system to pay a smaller amount to a content creator who can make a very targeted video that might just go viral? You might think that is a good thing for YouTube but it really isn’t. If I then publish Acme cola without telling YouTube about it and rival Widget cola sees their pre-roll ad on an Acme cola video, then Widget cola could go back to YouTube and ask for money back or just pull their account alltogether. Its an extreme reaction, but I have actually seen it happen while creating videos with fourtune 500 companies. They are very sensative to having a competitor’s ad running on their videos. What is YouTube Calling “Product Placement”? They have identified placement in two categories. “Graphic cards” vs. “Text Cards”. Graphic cards are logos of the sponsored company in the frame of the video. They could include product placement itself.So in other words, don’t have a banner of Acme Cola on your back wall. It could be identified as a product placement. On the same token, a can of Acme cola on your desk could also be tagged. What you CAN have is a text card that doesn’t look like the brand graphic. This includes fonts in some cases. If Acme Cola used “Acme-Cola-font”, you won’t be able to even use “Like-the-acme-cola-font-font” in the card – that will be seen as a graphical card. A standard text card might just be a lower 3rd or mention in the credit roll. If you watch a TV show, the end credits may say “Promotional consideration for the following”. This usually acknowledges the placement but not in a graphical manor. Most of my sponsorships are usually coverage to events like CES or SXSW. That includes travel, expenses and more. Lets say that Acme Cola paid only for travel and hotel to their event at their headquarters. In return I create a video with Acme Cola logos all over the place. Would YouTube then require a cut from that? Keep in mind the cut would be a percentage of Sponsorship dollars minus expenses accrued. In this case with travel and hotel paid for – It would most likely be a wash.
Here’s another example: If you do product reviews and get items from the companies, does that factor into product placement? A product you get to keep is considered income. Who Really Gets Affected by This Rule? 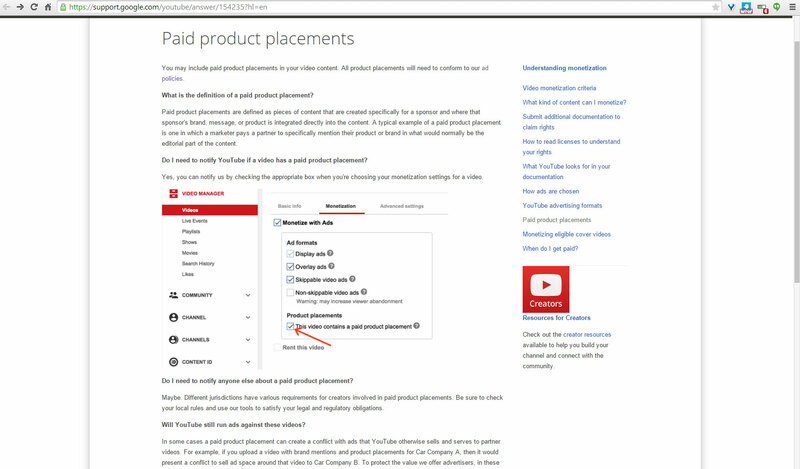 First of all, this is for YouTube Partners who must run ads of some sort on the majority of their videos. While small fish might run under the radar, bigger fish with millions of subscribers may get hit the most. After all they could make $100,000 or more on Youtube ads, then another large amount from a sponsor because of the high amount of views they get on every video. If you are on a partner network like Machinima, TGN, Social Blade and others, then Google’s fees are already taken out before you see your share. As long as you are not procuring your own ad dollars – which some of these partner networks prohibit anyway. Does this mean that I should close my YouTube partnership and just run off sponsorships? I suppose you could, but you lose a lot of options for your channel. I actually stopped running sponsorships on videos such as this one. The reason why basically became a game of numbers. No ad sponsor wanted to pay residuals if I went over a certain timeframe or amount of views. Yeah I got cash up front, but years from now I could be still making these companies money and not see a dime of it. There is going to be a learning curve off this. Most likely “bots” will determine if your video has placement and how it affects the overall video. You might get an email on a video that you received no ad dollars for externally. And then it comes down to explaining the video in email. The bigger issue will be the videos that might get rejected simply because there is a logo of Acme Cola in the background that is too big. If I am out at SXSW reporting, I might have to be mindful of what gets in my video frame – blurring out anything that could be considered placement. Editorial: Will YouTube Start stretching Their Wings? A couple years ago, Google closed their service where you could apply for specific companies’ banner ads on your website. AdSense still runs as a autonomous link exchange – only giving you options to deny certain brands. Maybe YouTube will start giving ad sponsorship opportunities. You get an email to put a static ad in your video for a CPM or fixed price. If I knew I was getting a good price for each time I run a specific ad (where YouTube gets their cut), I would be happy to build something around it. 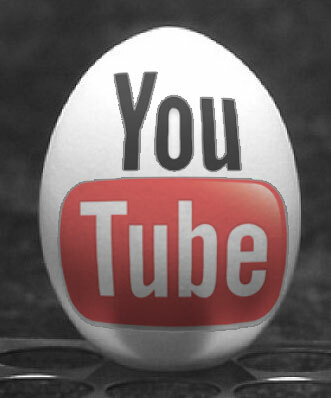 Bottom line: YouTube video repository is free to upload, which users upload 300 hours of content per minute. Its the #2 search engine in 75 countries world-wide – which means you could get more famous in Japan than you could the US. There are ways everyone can get paid for their content. Most of us don’t go to work and get paid while also getting a sponsorship fee for doing our jobs.